Featuring Ann Miller, violin; Vicky Wang, cello; and Sonia Leong, piano performing works by Haydn, Mendelssohn and Paul Schoenfield. Trio 180, the faculty piano trio-in-residence at the University of the Pacific’s Conservatory of Music, is dedicated to its roles as performer, proponent of new music, and educator. 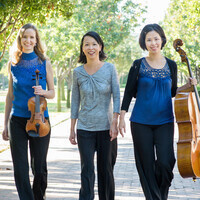 In addition to giving concerts and master classes throughout the United States, the trio has been featured on concert series in Mexico and Canada. The group performs a wide range of music from the Classical era to the present and is an active advocate of new music. Learn more on their website. This concert was rescheduled from November 15. Tickets at the door or at go.pacific.edu/musictickets.